The month of March is nearly complete as I write this and warmer, more pleasant weather is finally upon us here in the Midwest. The Milwaukee Bucks are gearing up for what I'm hoping will be a deep playoff push and the Brewers are beginning what should be another exciting season as well. With March nearly complete, it's also time for me to examine the dividend increases I received for the month and look ahead to the increases expected for April. Williams Sonoma (WSM) announced an 11.6% increase in their quarterly dividend from $0.43/share to $0.48/share. This was a bit above the 9.3% increase I was expecting for my dividend increases in March 2019 article. Overall, my annual forward dividends increased by $1.20 across my 6 shares. Realty Income (O) announced a 0.2% increase in its monthly dividend from $0.2255/share to $0.226/share. This was exactly what I was expecting. Overall, my annual forward dividends increased by $0.024 across my 4 shares. WP Carey (WPC) announced a 0.2% increase in its quarterly dividend from $1.03/share to $1.032/share. This was actually a bit below what I predicted. 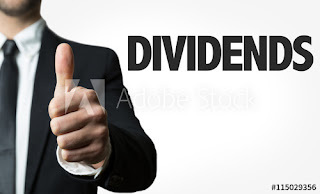 Overall, my annual forward dividends increased by $0.024 across my 3 shares. I'm expecting XOM to raise its quarterly dividend by 4.9% from $0.82/share to $0.86/share. This would increase annual forward dividends by $0.96 across my 6 shares. Given the $34 billion acquisition of Red Hat last October, I'm expecting a lighter dividend increase from IBM than in past years. I'm projecting a quarterly dividend increase of 1.9% from $1.57/share quarterly dividend to $1.60/share. This would mean an increase in annual forward dividends of $0.36 across my 3 shares. I'm expecting a 5.6% increase in JNJ's quarterly dividend from $0.90/share to $0.95/share. This would increase annual forward dividends by $0.40 across my 2 shares. I'm expecting a routine 0.6% increase in EPD's quarterly dividend of $0.435/share to $0.4375/share. This would increase my annual forward dividends by $0.09 across my 9 shares. I'm expecting a 3.3% increase in SO's quarterly dividend of $0.60/share to $0.62/share. This would increase my annual forward dividends by $0.40 across my 5 shares. Expecting an increase of 1.8% in EQM's quarterly dividend of $1.135/share to $1.155/share. This would result in an increase of $0.32 across my 4 shares. The month of March produced $1.248 in dividend raises, with one raise being above what I expected, one being exactly what I expected, and one being below what I expected. It would take $31.20 invested at 4% to replicate the increases I received during March. Looking ahead to April, I'm expecting a $2.53 increase in annual forward dividends from dividend raises alone. To match this increase in dividend income by investing fresh capital, this would require an investment of $63.25, assuming a 4% dividend yield. Are you expecting April to be as busy a month as I am? Are you expecting dividend increases from any names not mentioned in this post? I'm pretty stoked to see what April brings although I expect the raises to be on the low side. We own XOM, IBM and JNJ and should also see raises from PG and UL announced during April as well. Agreed. It should be a very fun month on the dividend increase front to make up for what will be my second weakest month of dividends for the year. Thanks for the comment. Looks good to me. Can't expect too much from JNJ or SO for that matter. At least in the meantime their yields are pretty juicy relatively speaking. High yield or high growth? Agreed. JNJ will never blow the doors off with dividend growth, but they are certainly consistent in delivering mid-single digit dividend increases. Thanks for the comment. Never miss any new blog posts or updates. Sign up for email today!